Hard anodized none-stick cookware is a recommended alternative to traditional non-stick kitchenware. 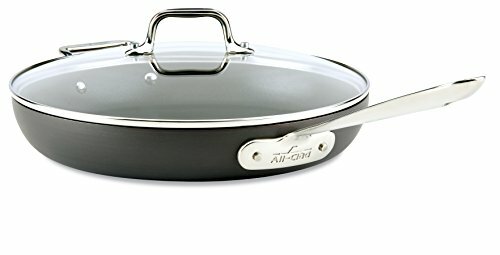 The metal used to make hard anodized cookware is aluminum. Even though aluminum by itself is bad for health, and anodization process helps keep aluminum from leeching into the food stuff during the cooking process. Anodization is a type of oxidation which is designed to deposit and ‘adhere’ oxygen ions on an aluminum surface. Oxidation is a naturally occurring phenomenon. Industrial anodization is an improved and highly managed version of natural oxidation. The basic process of anodizing is the immersion of aluminum into an acid electrolyte fluid, and passing an electric current through the aluminum. A cathode1 is placed within the container holding the fluid, and the aluminum piece acts as the anode2 which results in the oxygen ions adhering to the surface of the aluminum. 1 & 2: An anode is an electrode (a conducting material through which electricity flows) through which electricity flows into (something), and a cathode is an electrode through which electricity flows out of (something). The primary benefit of a hard anodized cookware is the non-stick nature of the hard anodized aluminum without the presence of industrial chemical coatings. Below is a complete list of benefits offered by hard anodized aluminum cookware. 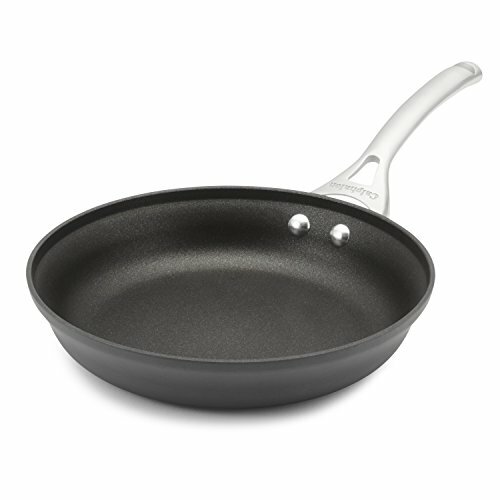 Non-stick surface: Hard anodized aluminum has a non-stick surface. 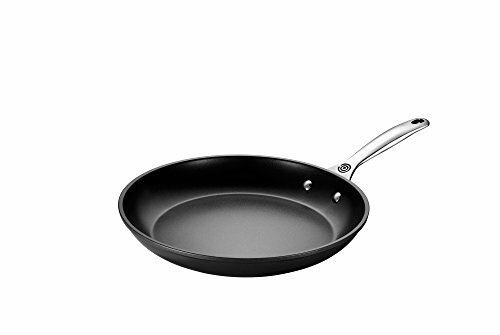 The non-stick surface resulting from the anodization process is not as non-stick as traditional non-stick surfaces, but as a benefit it is not toxic. Light weight: Since it is made from aluminum, hard anodized cookware is very light weight. Heats up quickly: Due to the nature of the physical makeup of the material, it heats up quickly, and relatively evenly, which helps with a better cooking experience. Can handle metal utensils: When used gently, a hard anodized pan can easily handle metal utensils without sustaining scratches. Anodization of aluminum is a self-limiting process—as oxygen ions are being deposited on the surface of the aluminum, and acid which is facilitating the process corrodes the resulting oxidation. Basic anodization creates a coating that is about 0.0002”-0.0006” thick. By using a higher voltage electrical current it is possible to increase the thickness of the coating to be 0.002” (or more), resulting in what is referred to ask ‘hard anodized’. Hard anodized cookware is a preferred alternative to traditional non-stick cooking surfaces, as hard anodized options do not leech chemicals into the food. There are two types of anodization which are utilized for producing non-stick cookware: anodized & hard anodized. Hard anodized is the preferred option as the coating of the cookware is much thicker (about 10 times as thick in certain cases) reducing the chances of aluminum from leeching into the food being cooked. It is important to pay attention to the fine print of the product you are looking to buy, as some cookware advertised as anodized is only anodized on the outer surface, and has regular non-stick coating on the inner part where there is contact with the food. Aside from looking out for tricks with the wording of how the product is described, it is important to pick cookware that is hard anodized, and is specifically labeled as such. Regular anodization only has a very thin anodized coating, so there is still a distinct possibility of the aluminum leeching into the food, especially if there are minor scratches and acidic food, like tomatoes, are being cooked. Le Creuset of America Toughened NonStick Fry Pan, 12"